Did you happen to catch Sunday night’s outrageous $555+ business-class fare? 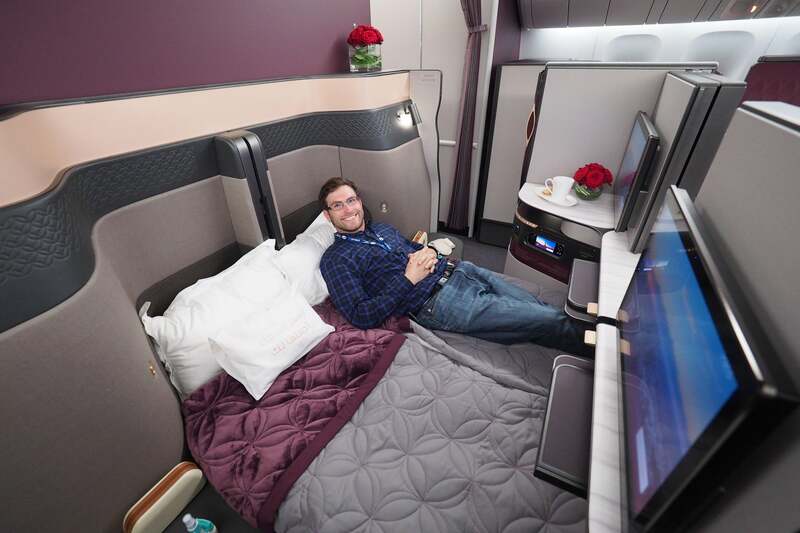 I opted to put the flight on a 48-hour hold to confirm dates rather than ticket right away — which unfortunately means I won’t be experiencing Qatar Airways’ fantastic A350 and Qsuite cabins for just $673 round-trip. That said, it seems that customers who managed to ticket their flights right away (and are traveling to the United States) haven’t had their itineraries canceled — yet, at least. So a hearty congratulations to those lucky folks! While it’s entirely possible that Qatar may choose to cancel US-bound bookings at a later date — and it appears that’s already happened for some customers traveling to non-US destinations — the airline will be on the hook for some customer expenses, as per a 2016 Department of Transportation ruling. Now, I’ve gotten some flak for my decision to put my reservation on hold rather than pulling the trigger right away — and, in this case, that cost me one heck of a deal. I don’t regret the decision, as it turns out that I likely won’t be able to travel on the dates I had planned (and I would have ended up having to pay a fee to cancel), but some customers likely opted for the hold and are able to travel. Now, unfortunately, they’re out of luck, just as in the case of tickets put on hold during American’s famous Beijing business “sale” back in 2015. So we’re all ready next time around, I’m putting together this guide to mistake fares, with five important tips (or considerations) for the next great deal. I’ve had airlines honor mistake fares in the past (and plenty have been canceled, too), but this time around I made an amateur mistake. Rather than ticketing the flight through Qatar Airways or an Online Travel Agency (OTA) to have the protection of a 24-hour cancel policy, I selected a free 48-hour hold through Qatar’s website, intending to complete my booking once I confirmed my availability in the morning. When I went to check the flight, I saw the message above, and a call to Qatar’s US reservations line confirmed that the airline had canceled my hold. Ugh. Why did I decide to hold instead of ticketing? Well, Qatar Airways skirts the Department of Transportation’s mandatory 24-hour grace period (for US travel) by offering a 24-hour (or 48-hour) hold, instead. If I were trying to lock in a $4,000 business-class fare, I probably would have been fine, but with a score this sweet, I’m not terribly surprised that the airline decided to scrap my ticket before I even had the chance to pay. Now, had I ticketed the flight, I would have been on the hook right away — and since I have a likely conflict when I was planning to travel, I would have had to pay a $330 cancelation fee to get a refund, or a $165 change fee (plus a substantial difference in fare) to move to a different Qatar flight. These policies were clearly outlined on the flight selection page, but you might need to do some digging if booking through another airline, or an OTA. Speaking of an OTA, in some cases that may be your best bet, since the travel agency may offer some protections that the carrier does not — in this case, the ability to cancel within 24 hours (or a similar timeframe) of booking. With Expedia and Orbitz, for example, flights are generally fully refundable if you cancel within 24 hours of booking, with the exception of last-minute reservations (with timing that varies by carrier). Meanwhile, if you’re looking to book with your Amex points (or earn 5x points with The Business Platinum® Card from American Express or The Platinum Card® from American Express, which also offers 5x points on flights booked through the airline), American Express Travel is especially generous when it comes to cancellations — you have until 10pm Central Time the following business day to “courtesy cancel,” so if you book on a Friday you’ll have until 10pm CT on Monday to cancel your ticket (note that this does not apply to Frontier). If you redeemed points for your flight, you’ll receive the credit back in cash — however, you should be able to have the cash charge reapplied and request a refund of your points (after the fact), instead. Either way, note that I specifically say Online Travel Agency — you’re really going to want to book mistake fares via the web, rather than calling in to an agent. While an OTA rep isn’t likely to phone up the airline to report a mistake fare, it’s not worth the risk. And if you call the airline directly, there’s a much better chance that they’ll feed it up the line, limiting the time you and your friends have to take advantage of an out-of-this-world deal. Consider using your points for a refundable stay at the St. Regis Maldives, rather than paying cash. While airlines have occasionally canceled (or decided not to honor) mistake fares days or weeks after the fact, more often than not these flights are canceled within a couple days of booking — or the airline will announce (or confirm to you over the phone) that bookings will be honored. For this reason, I strongly recommend avoiding booking any onward flights or nonrefundable hotels until you’re certain you’ll be able to fly. If you’re worried about flights or hotels selling out, this is a great opportunity to redeem your points and miles for travel — you may need to pay a redeposit fee for your award flight, unless you have elite status, but most hotel award bookings are fully refundable until a day or two before arrival. Once your mistake fare flight is confirmed, you can book nonrefundable travel, if you’d like. the airline or seller of air transportation: (1) demonstrates that the fare was a mistaken fare ; and (2) reimburses all consumers who purchased a mistaken fare ticket for any reasonable, actual, and verifiable out-of-pocket expenses that were made in reliance upon the ticket purchase, in addition to refunding the purchase price of the ticket. These expenses include, but are not limited to, non-refundable hotel reservations, destination tour packages or activities, cancellation fees for non-refundable connecting air travel and visa or other international travel fees. That second bullet is the kicker — in many cases, the airline could end up being on the hook for thousands of dollars in onward flights and hotels, with out-of-pocket costs that exceed the perceived loss of an honored mistake fare ticket. For this reason, we’ve seen airlines opt to honor mistake fares much of the time, as long as travel originates or arrives in the United States (and is therefore covered by the DoT policy). As much as I’d love to have another flight in the world’s best business class, it just isn’t in the cards this time around. Really, what I should have done in this case is book the ticket through American Express’ online portal and canceled by 10pm CT the next business day if I weren’t able to travel. By putting the flight on hold directly through Qatar Airways, I’m now entirely out of luck. Oh, and one last thing… While it can be incredibly exciting to score a fantastic flight deal, don’t get too excited just yet. Airlines are just as likely to cancel these flights as they are to honor them — if you get to travel, great, but if you don’t, there’s a good chance there will be another opportunity soon. In the meantime, you can always take advantage of a phenomenal credit card sign-up bonus and book a business or first-class trip with miles. What are your tips for taking advantage of mistake fares?